Most of us can’t imagine our kitchen without refrigerator. But one day any refrigerator can break down. The refrigerator door will not close properly. The freezer is not cold enough and the food goes bad. In that case all is left to do is to call repair guys to fix it. If you live in Inland Empire area, San Bernardino, San Gabriel Valley or anywhere else close by and you need your refrigerator fixed, you can call us anytime of the day. We’ll come the same day or next day and fix it on the spot. Or if it needs a new part we’ll order and install it for you. Before calling us try to find out what’s wrong with your refrigerator – it’s stoped working, poor cooling, overfreezing, leaking water, noise and etc. If it seems not working check the light or sound coming up from the refrigerator. Check if the outlet working well and the power is getting to the refrigerator. To do so, plug in a lamp or other device to the same outlet. If the power is not a problem, there’s most likely something wrong with wiring, thermostat, defrost timer, compressor, overload or relay. Then you would need to get a professional help. In case your refrigerator is not colling properly, check the termostat knob is turned to the proper setting. Also verify that the compressor motor is running. Poor cooling is often the result of a heavy frost build-up on the evaporator coils. To see those coils, remove a panel on the inside of your freezer. A sure sign that there is a build-up is the presence of any frost or ice build-up on the walls of the freezer. The refrigerator is supposed to self-defrost. Failure to do so causes blocking the coils and poor cooling. 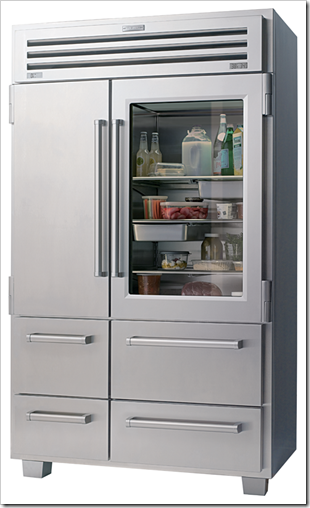 You can try to defrost the refrigerator manually, but it’s very time consuming and messy.